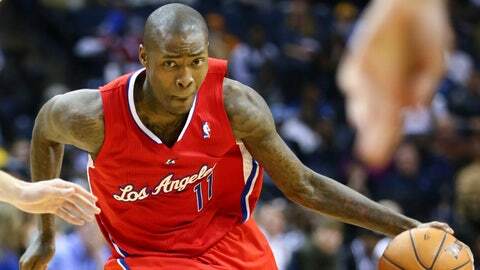 LOS ANGELES — The role of starting guard fits Jamal Crawford nicely. Then again, so does his role as a bench player. Crawford handles each job well, but for the past two games, he’s been paired in the Clippers’ starting backcourt with point guard Chris Paul. So far, the combination is working perfectly, with the Clippers going 2-0 and Crawford providing ample offensive support with his outside shooting. Crawford made his first start in 101 regular-season games last Saturday night at Washington, then started again in Monday night’s 115-92 win over the San Antonio Spurs, scoring 17 in each game. Clippers coach Doc Rivers prefers to bring Crawford off the bench, but Willie Green struggled with his shooting after being called on to replace J.J. Redick, who suffered a broken right hand and a torn ligament in his wrist last month. So Rivers summoned Crawford, a 13-year NBA veteran who was a starter with the Chicago Bulls and New York Knicks from 2003-2004 to 2008-2009. Crawford’s ability to hit outside shots kept opponents from double-teaming Paul or sagging in the middle defensively. Crawford was arguably the league’s best sixth man last season, although the award went to the Knicks’ J.R. Smith. Crawford won the award in 2009-10 with the Atlanta Hawks and essentially vowed to prove he can win it again this season. But it probably won’t happen until Redick returns in several more weeks. Crawford started slowly against San Antonio, missing all six of his shots. But he was 3 for 7 in the third quarter as the Clippers slowly pulled away. More than anything, he didn’t lose faith in his ability to score points or create shots. I still love him (Crawford) off the bench because of what he provides there, but right now we need him as a starter.